Around this time of year, if you’re a baseball fan, you sometimes wonder—why. Why am I watching these overpaid grown men try, with unimaginable difficulty, to hit or catch a small ball and then run around some dirt? What meaning does it have in my life, this artificial drama that consumes so much time and can often be completely frustrating? Especially compared to the presidential debate, which took place in a parallel time slot to the Mets at Marlins game last night. The balance of the world’s fate, versus a trip to the playoffs. No contest in terms of import, right? Nuclear football and all that. And yet. Backing up to Sunday morning, in a terrible tragedy, Marlins’ ace pitcher José Fernandez was killed the previous night in a boating accident in Miami, along with two others (not star pitchers, since I don’t think I’ve heard their names; in fact their deaths seem sadly incidental). 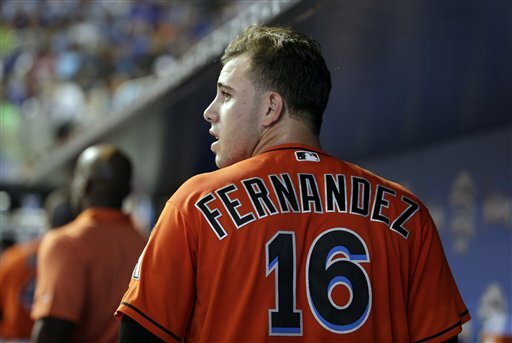 Fernandez, just 24, as a teen had tried to escape from Cuba three times before succeeding, in the process receiving a year in jail, and another time, rescuing his mother who had fallen overboard. Once in the states, his quick elevation from class A to the big leagues underscored his pitching skill, but apparently he was the warm heart of the clubhouse as well. Fernandez was supposed to pitch in last night’s game (Sunday’s was canceled), lending even more poignancy to the setup. 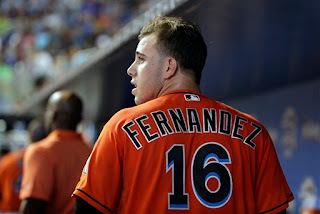 The Marlins had multiples of Fernandez’s #16 jersey fabricated for the whole team, and they scrawled JF and RIP on their black caps with silver sharpies. For their part, the Mets (led by Yoenis Céspedes, a fellow Cuban) taped up a specially-made Mets Fernandez jersey in the dugout, fixing the tape and taking care to keep the jersey smooth. The pre-game ceremony included a somber tribute to Fernandez, including a haunting solo trumpet version of “Take Me Out to the Ballgame,” a color guard salute, and the anthem, sung by a children’s chorus. I would be surprised if there was a dry eye not only in the stadium, but among the millions watching on tv. Even the empathic, but always professional, SNY announcer Gary Cohen choked up as he was trying to narrate the scene. 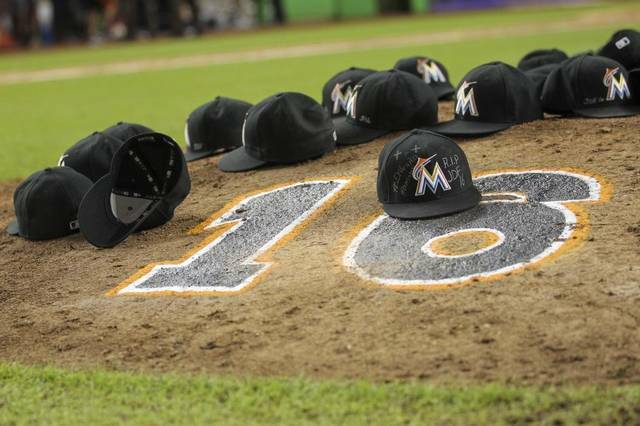 The Marlins’ players were visibly sobbing, their faces contorted with the pain of true grief. Both teams went on the field and all the Marlins hugged all the Mets. Céspedes is nothing if not stoic, but he was the one who lingered the longest, and seemed to hug the hardest to mourn the loss of his fellow countryman. The game dutifully began, feeling like a sodden chore, although its outcome was of prime importance to the Mets, who barely lead the wildcard playoff standings. With the usually steadfast Bartolo Colon pitching, Marlins’ lefty hitter Dee Gordon stepped to the plate batting righty, and wearing Fernandez’s helmet, both in tribute. He whiffed, turned around, and jacked a towering homer into an upper deck—his first of the season. He was suspended 50 games earlier in the year for using banned substances, and by his slight frame and nearly childlike stature compared to Bunyanesque teammates like Giancarlo Stanton, you can almost understand why. But the homer was like a scene out of The Natural, when some supernatural power took over and carried the ball to heaven. Literally, that’s how it felt. Cue more heart-rending emotion as Gordon ran around the bases, sobbing, tears streaming down his face. He was embraced and bear-hugged in the dugout after this cathartic act that seemed to release the Marlins from their frozen state of grief. Then I flipped to the debate (really, if you haven’t decided by now between the two, what would 90 minutes of basically avoiding a huge faux pas mean to your decision?). I saw Trump spew lie after lie, denying his own ludicrous statements and heinous actions, bellowing, gesticulating, sniffling, and interrupting Clinton every few minutes, a bully cornered in detention, snarling and lashing out. 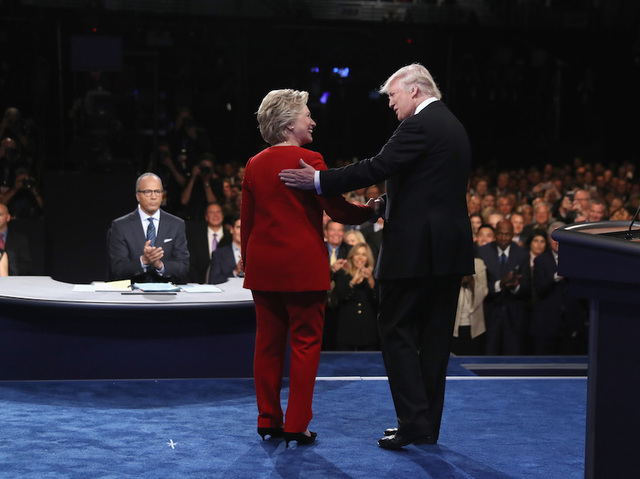 Clinton seemed poised, confident, well prepared, even good humored; her best tool was to allow Trump’s torrent of words to hang in the air and speak for themselves. It felt like the world was upside-down. What had felt like a life or death outcome to be “decided” by this debate was, in contrast to a ritual of pure grief and mourning, irrelevant. The game had become a metaphor for the evanescent joy of life and its painful loss, the debate merely motions to be gone through. That said, ask me in two months, after the election and the World Series, how I feel about this. It may change.